Day quiet until about 1600 when during shelling of Franklin’s Post a few shells came very low over right of our line bursting about 100 yards behind trenches. Night uneventful nil report from patrol. 2 men to hospital, routine as usual. Quiet day, a few shells as on previous day over trenches about 1700. Patrol came into contact with enemy outpost at 92Z5 but retired without incident. Capt Hammond and 3 men to hospital. About 0900 six shrapnel burst over right of line, pieces falling both hqrs, no casualties and no damage done. Remainder of day and night uneventful. Patrol reported no sign of enemy in near neighbourhood. 2 men to hospital. Line again reorganised and shortened. Orders received for relief on following day by Suffolk Yeomanry and 1/5 Norfolks as part of new centre and right sectors. Day quiet, but much firing on extreme right throughout night and movement generally along except immediately to our front. Patrol observed by enemy soon after going out, and being fired on considerably, retired eventually without getting into actual touch with enemy. 1 man to hospital. Relief by Suffolk Yeomanry and 1/5 Norfolks completed, soon after dawn. Battalion proceeded into rest camp, now known as Penton Hill where day spent improving dugouts. One small brigade fatigue. 3 men to hospital. Uneventful day and night. Routine as usual. Lients Ford and Jones and two men to hospital. Lieut Harding returned from the hospital. Buffalos paraded for divine service at 16.45. Parade inspection as usual. A few shrapnel shells burst to rear of camp and ? pieces of shell fell in camp: no damage or casualties. Five men to hospital. Lieut Stanbrook returns from the hospital. By the beginning of November 1915, the nightmare of the Finsbury Rifles’ stay on Gallipoli was nearing its end. Dysentery was still taking its toll: 17 men were sent off on sick leave on 30th October. There was now not much fighting on their front, though plenty of shelling and snipers to beware of. Occasionally, one side or the other attempted a limited advance, and fierce little battles developed. A pattern was established during most of November 1915: In rotation with other units, the Rifles spent five days on the front line and five days down the hill in reserve. They got to know the ravines, sharp little peaks and scrubland around Aghyl Dere very well. 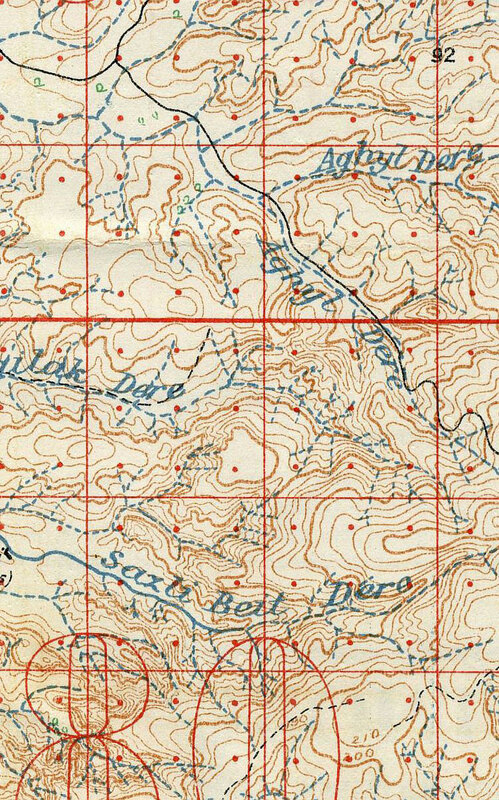 The contour lines on this map give some idea of the difficulties they faced in any movement. It was very hilly! If the Rifles were hardly moving, the top military men were on the march. The new commander-in-chief, General Monro, arrived in Gallipoli on 28 October to replace Sir Ian Hamilton. On the 30th, he rushed round on a whistle stop tour to visit all the places where the British and their allies were fighting. He was horrified by what he saw. He immediately wrote to Lord Kitchener, the Secretary of State for War, that the Allied forces held positions that possessed every possible military disadvantage. ’The mere fringe of the coastline had been secured,’ he noted. Monro could see no sense in the troops staying on in Gallipoli, and recommended evacuation as the best option, although he was concerned that the Allied forces might suffer many casualties as they withdrew. Back in London, General Monro’s recommendation jolted and scared Lord Kitchener. The risk of heavy casualties worried him and he also thought Britain would lose face in the world, particularly in the Muslim world, if we withdrew from Gallipoli. So he spent time exploring some silly ideas, such as a proposal for yet another landing on the Turkish coast and another for a new attempt by the Royal Navy to smash through the narrow channel of the Dardanelles to Constantinople. Fortunately, Kitchener had the sense not to take up the ideas, which would have led to further catastrophe. He went to Gallipoli. ’Thank God I came to see for myself,’ he said to ‘Birdie’ (General Birdwood), ‘I had no idea of the difficulties you were up against.’ Kitchener agreed that withdrawal must go ahead. [NP1]May be add a photo.